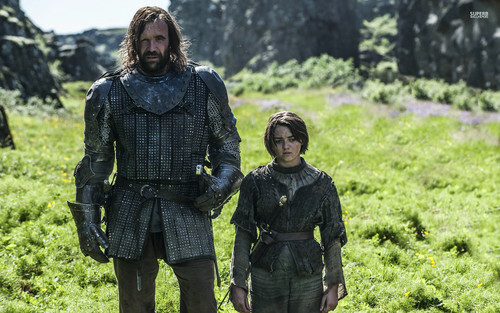 The Hound and Arya. . HD Wallpaper and background images in the गेम ऑफ थ्रोन्स club tagged: photo wallpapers game of thrones the hound rory mccann maisie williams arya stark. This गेम ऑफ थ्रोन्स wallpaper might contain घोड़े रैंगलर, रैंगलर, घोड़ा रैंगलर, surcoat, सुरकोट, ढाल, भाला, बैकलर, and बाकलेर.